Greeting guests at the Magnolia Art Xchange. I first became involved with MAX while trying to help a fellow student at Florida Center for the Blind. He was a visual artist that had lost his vision to diabetes. He thought he needed to find someone that could teach him how to become a sculptor so he could continue to be productive. During my journey to help him I learned many things about art, the art community, art therapy and most of all, that there wasn’t anywhere I could lead him for help. That’s when I found MAX and I was so impressed with work they had already accomplished, and that their mission was focused on expanding the possibilities for so many diverse individuals while bringing them together to build a strong community. I have learned the power of art therapy by watching a local artist go into an assisted living facility and teaching dementia residents to paint. Residents that I saw week after week that showed little to no expression, smiling and some even laughing at each other’s art. They had an art show in the lobby and all the friends and family came to see their work. It was one of the most powerful, positive experiences I have ever witnessed. It was the first time, for some of them years, that they had anything positive to share with their loved ones. Also, how art literally save John Bramblitt’s life after losing his sight at age 21 and considering suicide. He now is the most notable blind artist in the world with three Presidential Service Awards for his work giving classes in incubators similar to MAX. The MAX board has strong leadership, are fiscally responsible, committed to the community as a whole, have a rock solid business plan and committed support from the City of Ocala and FAFO. I hope you will share my vision of the possibilities, and like me, put your support behind this incredibly positive organization. While never working in the arts, other than being the 25th anniversary Mother Ginger in The Nutcracker, Harry has been a lifelong activist in the community. He has been everything from E-8 Master Sargent in the Florida National Guard, Licensed Optician, Licensed Body Wrapper, Licensed Insurance Adjuster, CEO for a distribution warehouse, Certified Building Contractor, Medical Account Executive. And now, after becoming legally blind, a full-time motivator. Past Board of Director for Professional Opticians of Florida, Leadership Ocala Youth, Historic Ocala Preservation Society. The power that can come from a group of artists is exponentially greater than that of a lone artist. Most great art movements can be sourced back to a small group of artists and the generous patrons who recognized the value in their brilliance. These movements change not only the communities which house them, but the entire world. I am an artist – a painter and a graphic designer, a creative director, and an ever-long student of art history. My perspective combines appreciation of fine art and marketing, and the power they wield when properly elevated and shown to the world. I am very happy to be serving on the board of directors for the Magnolia Art Change because I know it will be a huge boost in this arena for the City of Ocala. I wish that there had been an organization like the Magnolia Art Xchange when I was an art student and starting out in my career over 26 years ago. Artists are filled with talent that the world is hungry to see the fruits of, but more often than not they don’t have the business training to go along with their creative skills. Ahhh the lessons I have learned through out my career that I would have benefited from learning from professionals early on. The idea that artists can come together and share knowledge, resources and ideas is extremely empowering! Further, the opportunities for workshops, collaboration, affordable studios, education, exhibitions, exposure and those ever-elusive sales is very exciting. I am proud to be serving with this board, whose members have been working so hard over the past years. I am impressed with what our group has accomplished thus far and SO excited to see the operations begin! I know I am benefiting from the collaboration and from being of service – and I know that everyone in the community will benefit once MAX opens its doors in full force! Local competition helps to shape artist's career. MAX’s Student and Emerging Artist Competition is a perfect example of how one show, no matter how small, can change the course of an artist’s career. That is exactly what it did for me. This one juried exhibit was just the jump start that I needed to get my career as an artist moving in the right direction. Through this competition I not only secured a position at the First Friday Art Walk, but I also gained the confidence and motivation that I needed to really put myself out there as an Artist. With the support of MAX, the City of Ocala, and the local community, artists like me feel more welcome to share their talents with the public. By participating in local art shows and events like the Art Walk I have been able to interact with people of all ages, garnered priceless feedback on my work, and have been invited to participate in more shows and events. These experiences have guided me as an artist, and also had an impressionable impact on my actual artwork. I am simply more inspired. It has also been incredible to see how MAX has helped the City of Ocala welcome more art into the community. They have planted a seed of creativity that continues to grow and inspire me daily, and I’m grateful to be a part of it. The MAX artist in residency program is a game changer for our art community. Artists will be able to interact with not only each other but with the local public. This program will shine a creative light on the city that will bring inspiration, art, and the people together in so many beneficial ways. Not only will it allow artists to grow and inspire one another, it will also be way for the artists to give back to the community. I would jump at the chance to be a part of such an exciting and educational experience, not only as an artist, but also as a citizen of Ocala. It is exactly what artists like me need to grow in their careers and is exactly what Ocala needs to bring all demographics together for the love of art. It's no mystery that art and culture are important for both economic development and a happier way of life. As a local artist, I think it is truly exciting to see an organization like the Magnolia Art Xchange (MAX) making such large strides in our community. This hard-working group of individuals have big dreams for Ocala's future and are dedicated to turning those dreams into a reality that is beneficial for everyone. Participating and earning an award at MAX's 2016 Student and Emerging Artist Competition was a wonderful experience that yielded many great benefits to my artistic career. With prizes like a seasonal booth at the First Friday Art Walk and membership to the Appleton Museum, I have become more involved in the growing local art community. Jordan Shapot is a professional artist who studied at both Citrus County's Lecanto School of Art and Savannah College of Art and Design. 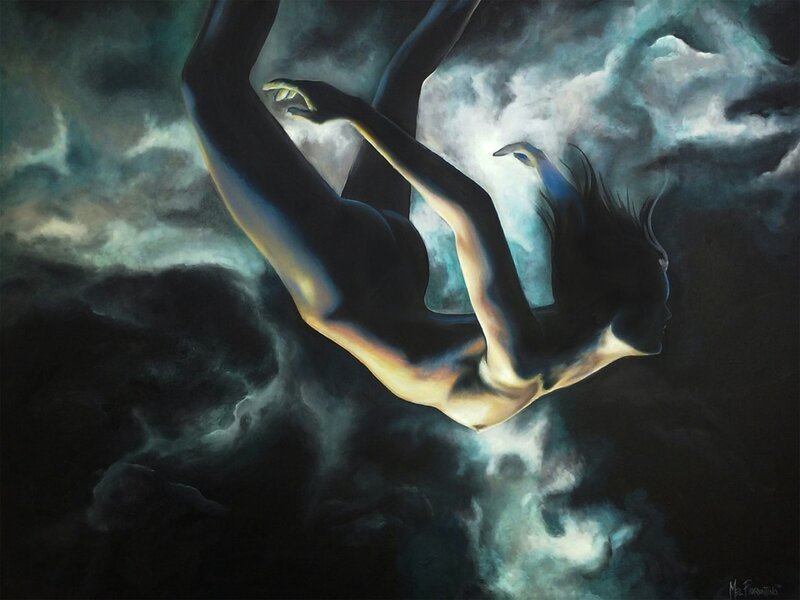 He often focuses on the role of identify in his oil and mixed media artworks. He also enjoys teetering on the fine line between representational art and abstract art, while portraying the emotion and essence of the chosen subject matter. 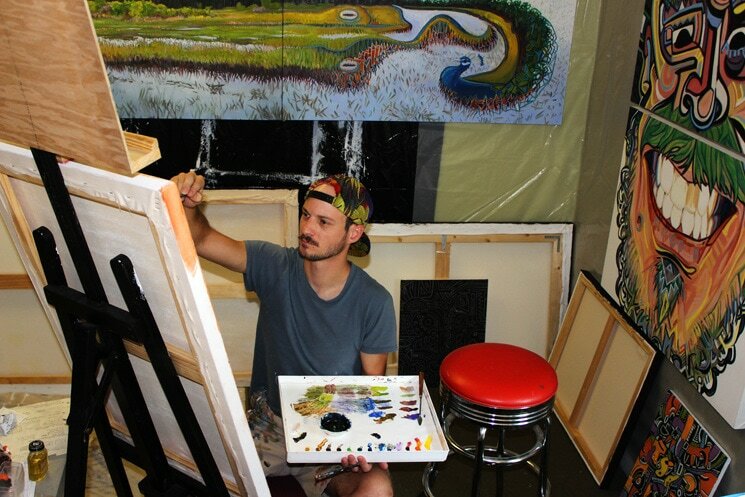 Jordan Shapot is a local artist currently working an living in Citrus County. You may learn more about Jordan and his work by visiting www.jordanshapot.com. I am originally from upstate NY and came to Ocala when I was about 7 years old. My childhood was full of artistic endeavors, so here I am today, continuously working on my career as an artist and mentor to other young and aspiring artists. When I was in college I studied with Jack Thursby, who I feel so fortunate to have had guidance from while I was trying to find my path as an artist. It is every-changing; it something to absolutely embrace; and it's an amazing self-discovering journey. I have been painting for about 16 years at this point and have always tried to get involved in art events here in Ocala and continuously felt we needed more resources for artists in our community like workshops, lectures, community projects, residencies, etc. Now we finally have the chance to bring something great to not only our artists, but for our community. 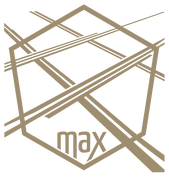 MAX will bring a complete artist hub, learning station and incubator to artists from all backgrounds, no matter if they are just starting out, been in the field for years or if they are thinking about dabbling into the arts. Studio settings are important for artists, I know from when i was in Thursby's classes, there is nothing like having a bunch of artists in one room sharing ideas and helping one another. The combined concepts from just having another artist working along side you was so helpful...I miss that. The MAX studio spaces will be this for artists...just a question away from a brilliant idea! I can absolutely say that when I heard of the ideas and passion behind everything involved in the Magnolia Art Xchange (MAX) I became excited about what kind of future that something like this can bring to Ocala. I wanted to do my part and help our community, so I joined the MAX Board of Directors and now I am working with some of the most wonderful, creative and passionate people that share the same ideas for artists in our community. As an artist myself I know that we thrive on energy from others, so this Art Incubator will do wonders for any artist out there with questions about how to further their career...it is very exciting and I can't wait to start working with these artists! 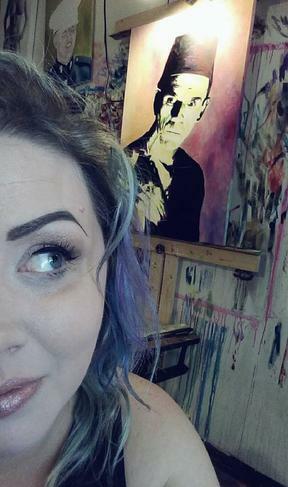 ​I'm 25 years old, a local artist residing in Ocala, Florida. 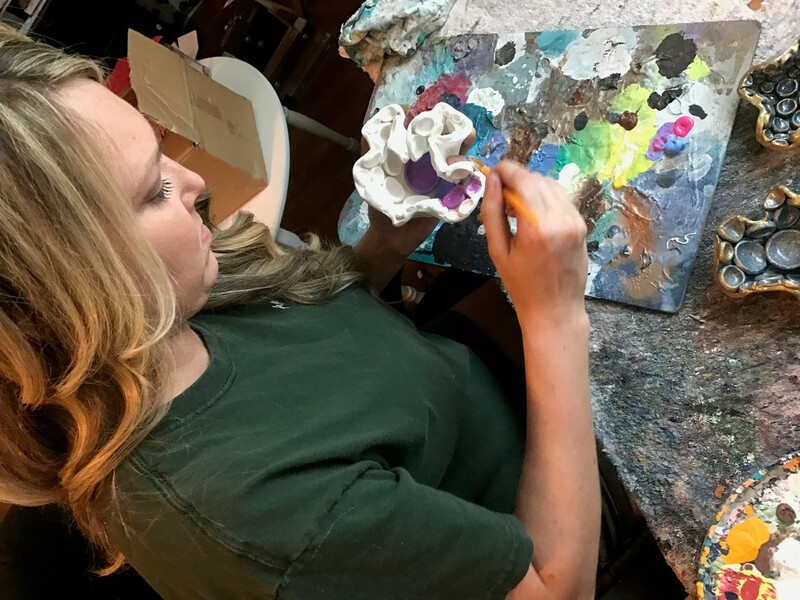 I have earned a Bachelor of Fine Arts and am interested in multiple forms of creative expression including digital art and design, animation, ceramic works, painting, drawing, and sculpture. Recently, and for the foreseeable future, my main focus has been on 3-dimensional works of art and design both physical and digital. I love to explore different methods of creativity as there is always something useful to learn and can apply those experiences to various aspects of my art and my life. Participating in the Student and Emerging Artist Competition gave me something tangible to work towards with my artwork at a point in time when I needed it. Goals, however large or small, play an important role in improving oneself. Winning first place in my division was a solid confidence booster and the rewards were also worthwhile - I used the Blick gift card to purchase a fresh batch of sculpture supplies to experiment with and develop technique, and access to the Appleton Museum of Art provides an insightful look at artwork throughout history. Critique is very valuable in the development of an artist and their technique, and the competition regards of having the opportunity to participate in the First Friday Art Walk has provided an effective source of feedback from passer-bys and fellow displaying artists. Every moth I present my art I gain insight on what people notice in my work, and what I should refine. I am able to examine the effectiveness of my fellow artists in not only their artwork but their production and presentation. I utilize what I learn bit-by-bit and show improvement each successive month. When the MAX studios open they will be excellent in development for the artists that will use the space. Being in close proximity to fellow artists working on their pieces and techniques will allow for the direct and indirect learning as to how they solve problems and overcome challenges involved with conceptualizing and finishing their works of art. I remember how valuable the open studios were during my time at UCF to learn and share information and to focus on my craft. Ocala needs spaces like that. ﻿Why an artist in residency program? I have been fortunate enough to have participated in several artist residency programs across the country. These programs were pivotal in my career as a professional artist, enhancing my artistic vision, while also improving my professional practices and community awareness. It is difficult for an artist to work in a vacuum. Creating work alone in your own home is often isolating and uninspiring. Programs like MAX provide not only the physical space for art to happen, but the creative and mental space as well. These programs foster relationships that support artistic growth, constructive criticism, project collaboration, and professional feedback. Working alongside others builds personal and professional relationships. It was through participating in these types of artist residency programs that I learned valuable sales and marketing skills. I served on the MAX Project Steering Committee during the initial research and planning phase, and strongly believe our community needs to support MAX as a local artist incubator. Since living in Ocala, I have traveled to participate in two residency programs. If something of this nature were offered in Ocala, not only would our local artists benefit from this amazing opportunity and resourse, but we could become a destination for artists nationwide. Your support of MAX can make this happen! Meagan Chaney Gumpert is a studio artist working with low fire clay and kiln cast glass. Primarily inspired by nature, her wall reliefs and sculptures are held in numerous corporate and private collections and are shown nationwide. She has served as a Resident Artist at Arrowmont School of Arts and Crafts (Gatlinburg, TN), the Clay Studio of Missoula (Missoula, MT) and Watershed Center for Ceremic Arts (Newcastle, ME). Gumpert has a BA in Studio Art from Meredith College and completed a post-baccalaureate ceramics program at the University of Florida. She now teaches workshops and maintains a private studio in Ocala, FL where she lives with her husband and two young children. Learn more about Meagan's art at www.meaganchaneygumpert.com. The 2016 Student and Emerging Artist Competition opened so many doors for me as an aspiring artist. What started as something I thought I'd try out for fun ended up being the foundation for my breaking into the world as an individual, professional artist. Upon winning first place in my division, I earned more than just the accomplishment and tangible prizes they gave me. I earned relationships and experience through those relationships. I've met many, many people in the arts community here that I never knew existed, and so I was able to become the beginnings of a professional artist. One of the prizes for winning the competition was entry to the First Friday Art Walk, and I can easily say this prize is the most valuable. For the first time, I was selling my artwork, not with my school or with a parent or supervisor: it was me. And just as one of my customers pointed out to me: this was my business. Because of the Student and Emerging Artist Competition and the award that encouraged me to participate in the First Friday Art Walk, I was commissioned by a wonderful couple, Connie and Grady Carroll, to paint a mural on the wall of their house. I can easily attest to how much this has helped me grow as an artist. It is my first stepping stone in the professional world, and provided me with the experience of working closely with a client to work and rework a project to achieve a result that will please both artist and client. This commission taught me things about being a professional artist that I can't begin to explain. The Magnolia Art Xchange is such a fantastic phenomenon to have been created. 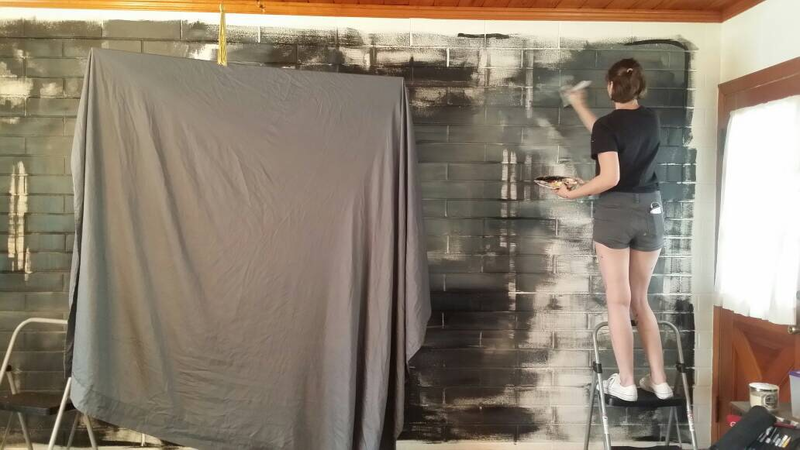 As an 18 year old artist finishing up high school and moving out, I will no longer have the studio space art class provided me. 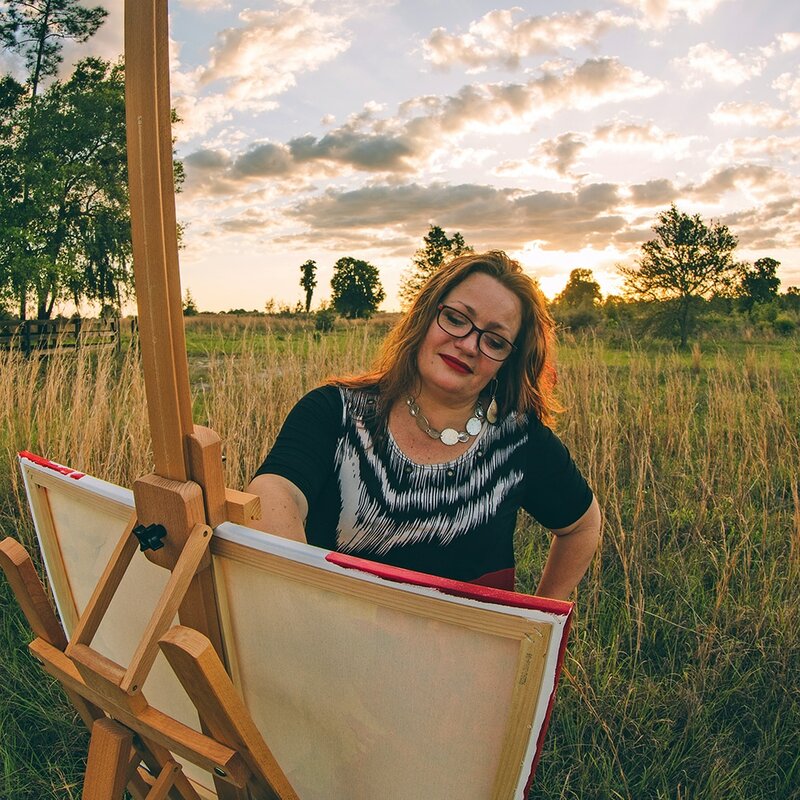 MAX not only offers studio space I could use to further myself as an individual, professional artist, but also collaborative opportunities and relationships that can be built upon as I slowly but surely enter the artistic community in Ocala. 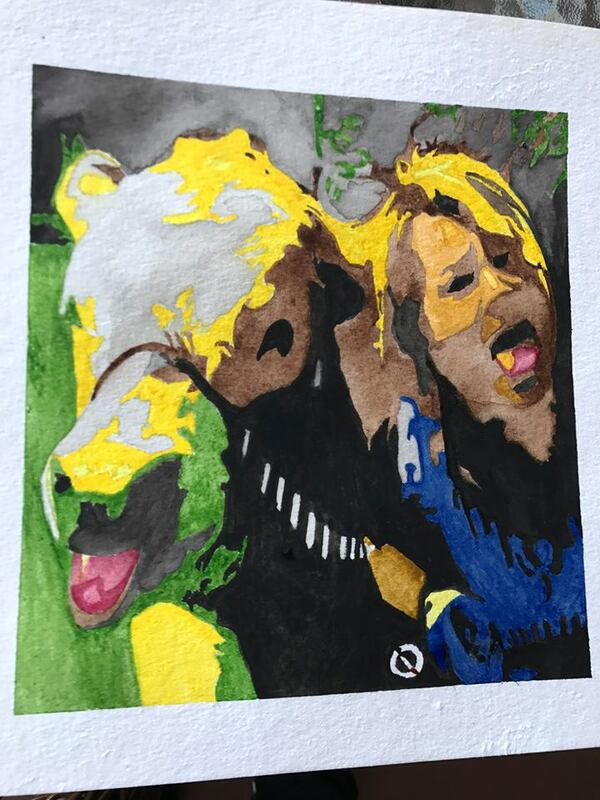 This blog is a series of testimonials from local artists who have been touched by MAX.